The finest tasting and most prestigious bottled water in the world is now available for delivery right to your doorstep. Mountain Valley spring water, a Premium Bottled Water which has twice been named Best Tasting Bottled Water in the World, is available for you. Perhaps even of more importance is the fast that it is only available in GLASS BOTTLES. 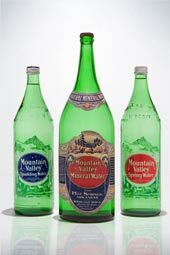 All Mountain Valley Spring Water available in Canada is sold only in glass bottles. We believe it to be the safest and most durable food grade material available. Our premium bottled spring water must be kept absolutely pure right from our source all the way to your body.